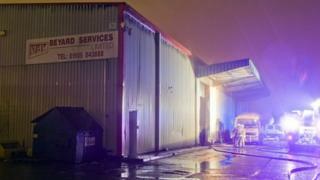 A large fire at a warehouse in Paisley in the early hours of the morning was started deliberately, police have said. About 30 firefighters were called to the Beyard Services building in Clark Street, Paisley, at about 03:20. The presence of acetylene cylinders forced the closure of a nearby railway line and the evacuation of local homes. No-one was injured and the blaze has been brought under control. The Paisley Gilmour Street line has re-opened and residents have returned to their homes. Crews from Johnstone, Renfrew, Clydebank and Milngavie were called out to assist Paisley-based firefighters in tackling the blaze. A neighbouring property in Clark Street was also searched after reports that someone was inside, although the building turned out to be empty. After acetylene cylinders were found at the Beyard Services building, Clark Street was closed and a 200m cordon was put in place. Firefighters were able to cool the cylinders, which can explode when heated. An investigation into the blaze is now being conducted by Strathclyde Police and Strathclyde Fire and Rescue. At this time, there is no description of any suspect. Det Insp Julie Henry said: "We are in the process of gathering CCTV images which we hope will provide further detail to assist in our investigation. "Thankfully, no-one has been injured but it's imperative we trace whoever is responsible for setting this fire. "I would appeal to anyone who may have seen or heard anything suspicious in the early hours of this morning, or anyone who has any knowledge about the incident, to contact us."